The new Lighthouse Solair 3350 and 5350 portable airborne particle counters distributed by Particle & Surface Sciences , offer sensitivities of 0.3 and 0.5 microns, respectively, at a ?ow rate of 100 litres per minute or 3.53 CFM. 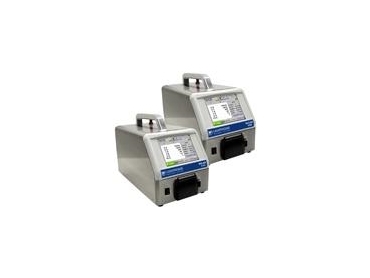 Housed in a 304 stainless steel enclosure, the Solair 3350 and 5350 airborne particle counters are suitable for use in facilities that require portable particle counter solutions. The built-in 5.7-inch (14.47 cm) colour touch screen makes the Solair 3350 and 5350 particle counters easy to con?gure and operate. The instruments can store up to 3,000 records of particle count data from up to six channels. All data can be quickly transferred to a computer or printed on the built-in thermal printer. Both models provide two modes of communication such as RS-232 and RS-485, making communications with these instruments ?exible. The Solair 3350 and 5350 particle counters can be used as portable instruments or integrated into a facility monitoring system.